A large shipment of medicine has been sent to Rojava as part of the ‘Brotherly Hand For Rojava’ Campaign run by the Pharmacists’ Associations in Kurdistan. 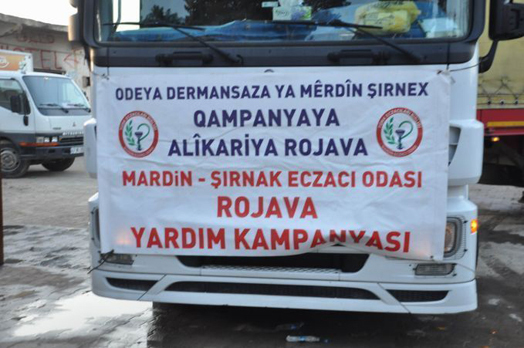 The campaign, which was started by the Pharmacists’ Association of Mardin-Şırnak, is ongoing. Thus far a trailer and one truck-load of medicine, medical equipment and other medical supplies have been sent to Rojava through the Şenyurt (Dilbêsîyê) border gate near the town of Kızıltepe.